This evening Jonathan, Andi, Stefan and me we went for highlining to the highline in the kletterkompetenzzentrum camp sibley. the highline is 14m long and about 15m high. This Day, Tobias Eder end me (Bernhard Gruber) we tried the 80m Slackline in the Schloßpark in Steyr. Tobi managed walking over the line for four times – awesome! i managed to the middle of the line – ok i have to train a bit more! 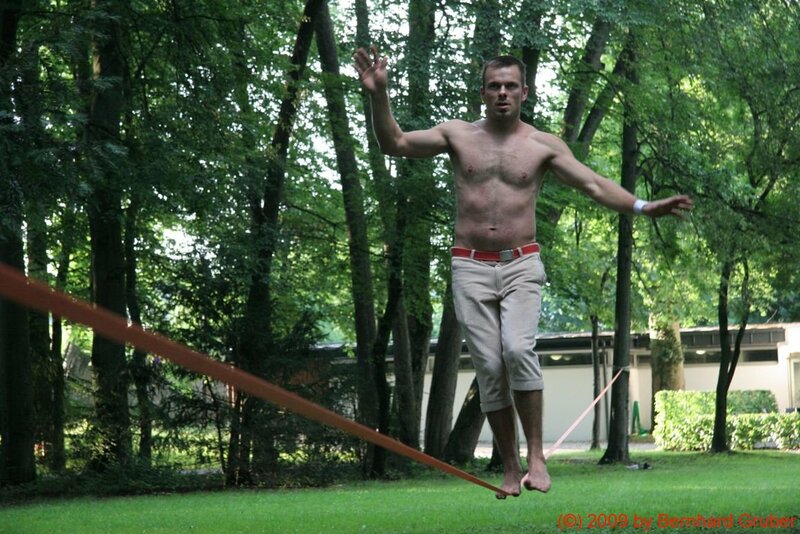 On the following day Andreas Huber managed the 80m slackline – respekt! This day i built the first time a 110m Slackline Setup at the Camp Sibley in Laussa. I used a chain tension (1500kg 5m), a slackbanana, 2 treeslings and 2 steelcarabiners and a 110m 25mm slackline from the Seilerei Peter from Wangen in Allgäu. thats it. i needed half an hour for tighten the slackline with the chain tension. hard work – really! the first meter had a good tension but after a while i got really bad bashes from the opposite side – woww. so i have a new project where i have to train for this distance. lets see when i can manage this long line! You are currently browsing the archives for the Slacklinen category.